Anakin Skywalker is a complicated character. Unlike his son, he does not have a clear line from point A to point B. Luke starts his story motivated by wanting to be like his father, and ends his journey during Return of the Jedi with, “I am a Jedi, like my father before me.” Mission accomplished. Even throwing in The Last Jedi, we can see exactly what caused him to fail and exactly what lead to him being redeemed. Anakin, on the other hand, is a bit all over the place. He’s tragic, and in classic tragic fashion it is a combination of many things. He falls because of Palpatine, Padme, the Jedi, the Sith, the war, the need for validation, and so much more. This is not to say that one story is better than the other, just that they are different. Tragedy vs. fairy tale. All the while, there is one tenant that is clearly discussed in the stories of both father and son. Attachment. No, possession. Wait, compassion. I mean, love. In Attack of the Clones, Anakin is clearly using his line on attachment as just that, a line. Cringable as it may be, it is still a pick-up line. But he is also onto something. One of the issues with the Jedi of the prequels is that their morality is flexible. Qui-Gon says, “We can only protect you. We can’t fight a war for you.” But, of course the Jedi do eventually fight a war. Mace Windu claims, “We are keepers of the peace, not soldiers.” But then they lead an army as generals, and Windu himself is prepared to be judge, jury, and executioner in Revenge of the Sith. So what Anakin is really doing here is working a loophole in the system. This is a dangerous tract to tread, as he soon finds out. The problem with all of these factors is that they are, inevitably, intertwined. Attachment will lead to possession. Compassion is always based on love; love will always battle with attachment. This struggle is what causes jealousy, fear, etc. 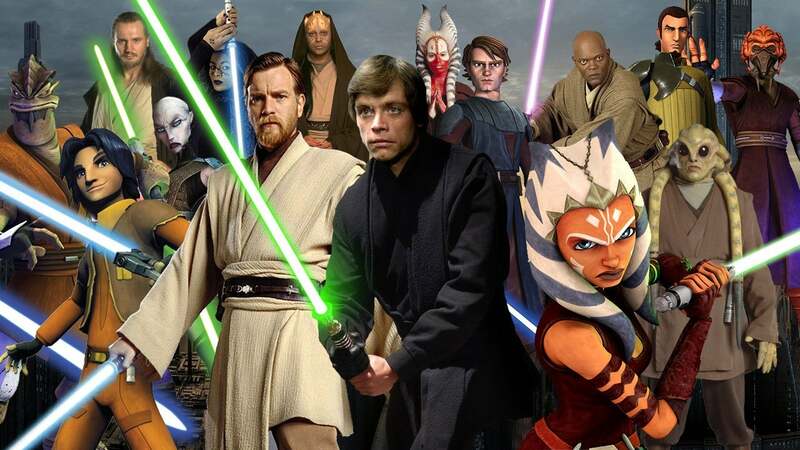 What makes a Jedi truly a Jedi is the ability to separate these factors. Anakin cannot find a way to do that. He becomes attached Padme to the extent of possession, his love for her feeding a twisted sense of compassion. We see what happens there. Conversely, Luke is able to separate those things. This, however, is not his natural inclination, and what makes his story so important to Anakin’s. When he starts his journey, he is attached to the idea of being like his father. That makes him, to some extent, possessive over his path to become a Jedi. He becomes inflexible and pushes back against Yoda’s training. Furthermore, his compassion for his friends gets manipulated by Darth Vader, causing him to rush off for his friends in Empire Strikes Back. We see what happens there. The differentiation between the two journeys comes in Return of the Jedi. When we start this film, we see a black clad Luke coming in and whooping some bantha poodoo around Jabba’s palace. As the story progresses, we see him struggling between his need to have the power that will protect his friends, and his knowing that said power can get out of control. Like his father, he is possessive and attached to the narrative he has created for himself, and his inability to let go of that nearly leads him down a dark path. Yet, right when it looks like he will follow in his father’s footsteps, he sees the error of his ways and throws his lightsaber away. He shows the ultimate love, sacrificial, in the ultimate act of compassion. We see what happens there. The Last Jedi would seem to complicate this simple arc, and to some extent it does. Luke has run off, cut himself off from the Force, and apparently abandoned the hope that drove him through the original trilogy. However, Luke does not see it this way. He sees running off to Ach-To and ending the Jedi as an act of compassion and love. He failed Ben, Leia, and Han, but his love for them, and the pain this failure caused, is the cause for his isolation. Again, Luke’s compassion drives him to make the difficult decision. The motivation is right, although the action is wrong. This is Luke’s lesson in TLJ, and a narrative that must be dealt with because of Anakin’s story. Anakin, likewise, is motivated by the right thing. He wants to save Padme and do what he believes is right for the galaxy. The problem is not the motivation, but the action. Due to Padme’s death, and his immediate death post-redemption, the audience does not get to see Anakin deal with that dichotomy. Enter old man Luke and his struggle with what he did on that fateful night in the hut. Like his father, his motivation was right. He wanted to prevent pain, destruction, and the end of everything he loved. Not a bad thing. Yet he is not doing it out of the selfless, sacrificial love Luke is known for; he is acting out of the possessive love his father is known for. When we get to Crait, we see Luke do what Anakin was never able to: apologize. Apologizing, when it is truly from the heart, is an act of immense compassion. It recognizes the fault and folly, and validates the pain that was created. In doing so, Luke gives Ben a final lesson. The ego that comes from attachment motivated be possession is what destroys. It is letting go of that attachment, giving one’s self fully to love, that helps us realize our fullest self.